"This is a revised version of our now popular (sold out) sheet. It includes more logos and includes actual silver foil Rolls Royce logos." My sample did not have the Rolls Royce logos in it, but does have two types of Pratt & Whitney logos as well as logos for G.E., CFM, and V2500 as well as IATA logos. 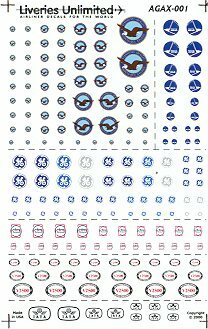 There is no instruction sheet with it other than to say that the Rolls Royce logos are on a single carrier film and that the Microscale system is suggested for these decals. I, for one, can see a real use for the P&W logos on some of my 1/72 and 1/48 WWII engines!